Throughout my student years, I would hunt down the cheapest barbers in town. It was a quick cut-and-go, unsociable cut which looked adequate at best and then you legged it out of there. I don’t think I got the true barber feel until I was around 25. It was then like a switch; how different a haircut experience can be. I was at the Singing Barber’s in Brighton, with Frank Sinatra playing in the background, the barber gave me a head massage, had a full discussion about how I wanted my hair styled and then spent 30 minutes working at my mop. Everything was different, but the thing that stood out the most was that the products used all smelt amazing. I can never turn back now, as a proper barber’s is the way forward for me, however it isn’t until recently I got to experience something close while at home. 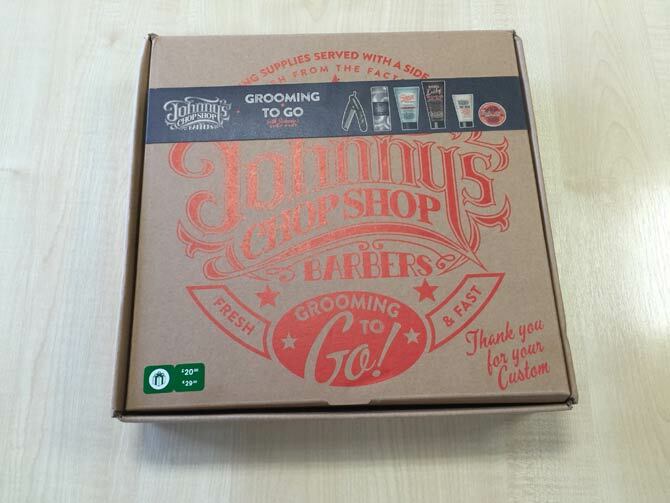 I recently got the Johnny’s Chop Shop Grooming To Go gift box, which is everything I was after. Before I get into the actual contents, I wanted to highlight how cool the box was! Not normally something I care about, as I will regularly throw away the packing and place my cosmetics in my draws, however this box I simply can’t throw away. It comes in what appears to be a pizza box, but with the inside styled out in a ‘50’s American’ look. When I opened it up, it got the same reaction from everyone in the room, as people were amazed by the box, a sign of some brilliant marketing and design work! Whenever I went to the barbers, they would always style my hair and it would keep the hold for the entire day, however when I used my basic wax or clay at home, it would lose the hold after around 2 hours. Well this stuff is the real deal! I only applied a small amount and my hair was sorted for a good seven hours without any movement. Tip: It says use on damp or dry hair, but personally it worked better for me when fully dry. This is a 2-in-1 product, combining shampoo and conditioner together. I have two sisters, so I’ve always been aware of conditioner, but honestly up until two weeks ago I had never once used it. It’s probably not as necessary when you’ve got short hair, but it did feel damn good afterwards! Perhaps slightly more interesting to me are the inclusion of vitamin B, glycerine and shea butter, all helping to protect the scalp and preventing hair damage. After I’ve got a haircut, I spend a good 20 minutes in the shower trying to get out all the little hairs and the one thing having a beard has taught me is how critical a face wash and moisturiser are post-shower. This face wash smells great, while it also is loaded with natural extracts. 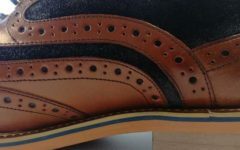 Made in Cheltenham, this is a locally produced product which is designed with style and class in mind. As I mentioned above, a moisturiser is probably the most important item on my list of cosmetics as I have had a beard since I was 15. The constant shaving has meant without a good moisturiser, my skin would be long gone. Well the all-purpose soul balm has plenty of skin protecting ingredients, such as avocado oil, glycerine, aloe vera, witch hazel and jojoba oil. It is also highlighted as a great balm to use after getting a tattoo (wish I had this a few years ago). The grey and white flannel is the perfect supplement to this gift set, especially as it is always the item I forget to buy. It’s 100% cotton and looks stylish (if that’s possible to say about a flannel) with the Johnny’s Chop Shop branding and logo. 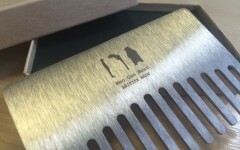 A proper barbers style comb, I first thought it was a flick knife when I opened the pack. I did wonder why they’d provide a flick knife in a shaving set, assuming it might be for the beard, but then realised my error once I flicked out the comb. Once again, it just oozes with sophistication, almost something you can see someone using in 1950’s America, which is a constant theme to the products and packaging. 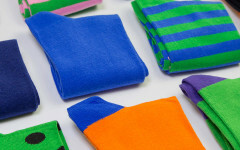 All-round, this is a brilliant gift for a guy, especially with Christmas around the corner. I recommend getting it for someone looking to step up their bathroom accessories.